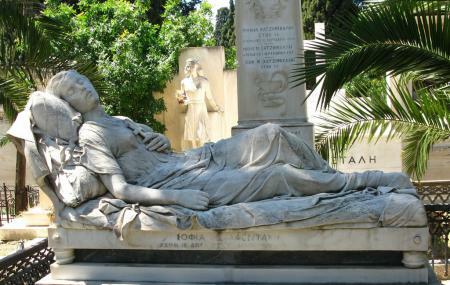 A somber but an important attraction, the Athens’ First Cemetery needs a visit for being the resting place for many a renowned Greek citizens and artists. A calm and quaint spot to explore during the afternoons, this cemetery allows you to think on the nature of human mortality. One of the famous names that have been engraved here is that of the archaeologist Heinrich Schliemann (1822–90), whose mausoleum is decorated with scenes from the Trojan War. While strolling amidst its pine trees avenue and large olives, you shall be struck with the works of art such as that of Halepas’ Sleeping Maiden sculpture created on the tomb of a young girl. How popular is Athens First Cemetery? People normally club together Aristotle's Lyceum and Monument Of Philopappos while planning their visit to Athens First Cemetery. This is an interesting place. It is pretty close to where I stayed so I visited it as I went to the Panathetic stadium. I was surprised by how ornate so many of the graves were. This is clearly the final resting place for upper middle class and rich people. It is quiet, tranquil and an cool place to visit. It is worth checking out if you have a chance. This place should be one of the places that you visit when you visit Athens. It is a sad but a beautiful place reflecting the respect for the ones that are buried here and also the history of Greece, it’s myths and mysteries. Outstanding sculptures, architecture. While I did not understand all, I believe that there are important figures buried there. (If not it feels like that) The path is hilly but easy to walk... also, it has great views of Athens, accompanied with trees that are old and sublime. Beautiful place. The First Cemetery of Athens is the official cemetery of the City of Athens and the first to be built. The cemetery is located behind the Temple of Olympian Zeus and the Panathinaiko Stadium in central Athens. This cemetery is under the Municipality of Athens and is declared an historical monument.